This is the 3rd of 52 weekly posts planned for 2018. It was inspired by the #52Ancestors writing challenge issued by professional genealogist, Amy Crow Johnson. The challenge: once a week, for all 52 weeks of the year, write about a relative in your family tree. Part of the fun of this challenge is getting to know some of my lesser known ancestors. Most of us have people in our family trees that seem to have "disappeared" from history. For some it is because they died young. For others it is because they had no children and were the "end of the line". Whatever the reason, it is a gratifying honor to find and tell their stories. Amanda (Rhoads) Hubert (1864-1903) is my 3rd great aunt. I only know of her because of a few census entries and the photo above. Here is a chart that depicts the relationship between Amanda and Ida. I use my great grandmother as the "Home Person" in many of my family tree charts because she is a good reference point to most of my living family. She lived to be 102! Those who weren't around when she was alive have certainly heard many stories about her by those who were. As you can see, Amanda is Ida's paternal aunt (making her my 3rd great aunt, aka 2nd great grand aunt). Here is what I know about Amanda. She was born about 1862 in Cambria County, Pennsylvania. There is some discrepancy about her year of birth, with some indication that she was born a few years later in 1864. Her parents, Rhinard and Eva (Paul) Rhoads (my 3rd great grandparents) were about 30 years old at the time. On May 18th, 1893 she married a William H. Hubert in Elton, Pennsylvania. She died at the age of 41 in 1903 and is buried in Sidman, Pennsylvania. A 1900 federal census record shows a William and Amanda Hubert living in Adams Twp., Cambria County, PA. 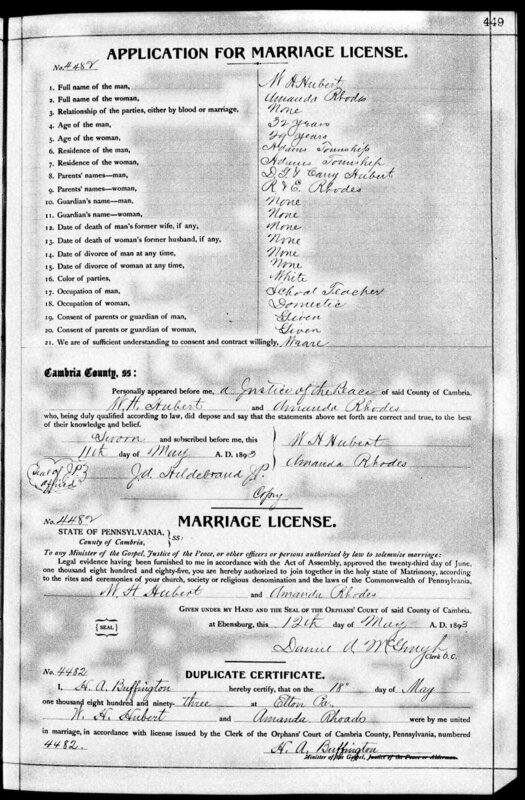 It shows the couple being married for 7 years, which fits with the marriage license above. No children are listed. Interestingly, there is also a 1900 Federal Census listing William's parents, David and Caroline Hubert, living right next to my my great grand mother (Ida Rhoads Sears) and her family! Ida was only 3 months old at the time. Most curious to me was a 13 year old Walter Roy living with David and Caroline and listed as their grandson. Amanda died in 1903. I was not able to find her husband on any 1910 census, and it appears that William died in 1910. There is some indication that he died in El Paso, Texas. But, he does appear to be buried, with Amanda, in Pennsylvania. Here is a Texas death certificate that matches the known details about William. 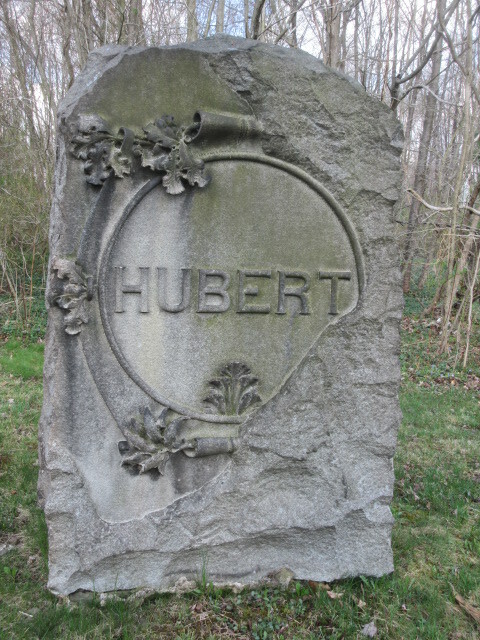 Here is the Hubert grave stone marking the final resting place of Amanda and William at the Sidman Cemetery in Sidman, Cambria County, Pennsylvania (photo credit: Find a Grave memorial id #94221664). The paper trail for Amanda goes cold after her husband's death. I found no evidence of them having children. I also looked extensively in newspapers.com, newspaperarchives.com, and genealogybank.com for newspaper clippings of any news or announcements. I found nothing! That doesn't mean it doesn't exist, just that the hunt continues. As I think about my family tree I am reminded of the mission of The Psychologenealogist: Exploring the spaces where psychology, genealogy, and history converge - one story at a time. When and why did William Hubert go to Texas? How did William and Amanda feel about not having children? Did they want them? Were they unable to have them? Why did Amanda marry later (near 30) and how did she feel about that? What happens to the stories of the childless marriages and whose job is it to tell them? What was my great grandmother, Ida's, relationship like with her "Aunt Amanda Hubert", whose name is written on the photo above in Ida's own handwriting? From my personal collection, this photograph shows several of the Cambria County, PA Rhoads men in my family tree. Here are their stories. 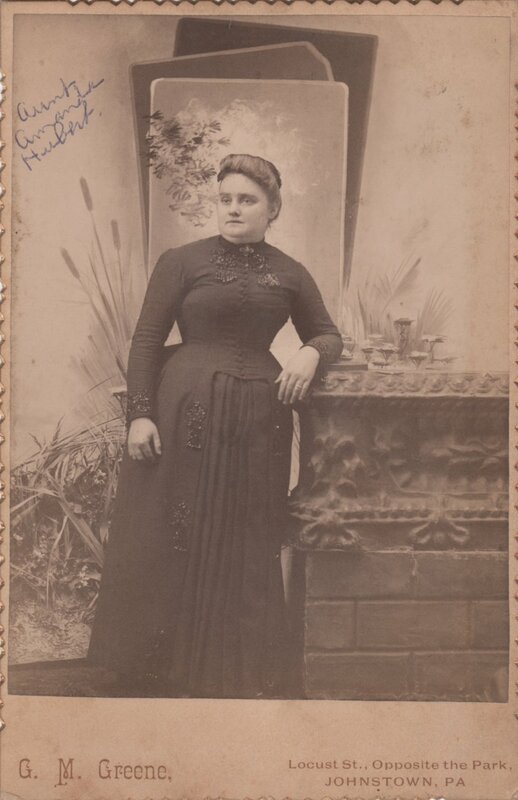 This is the story of my 3rd great aunt, Rebecca Rhoads Seese (1859-1940). James Costlow (1822-1904) is one of the more prominent figures in my family tree. In fact, he was written about in in the Biographical and Portrait Cyclopedia of Cambria County, Pennsylvania. This is his story.